For the past week I have been going back and forth from Heathfield to Brighton (and sometimes Hove) for a drama workshop. On my way to Lewes for the Cuilfail tunnel, I always find myself hurtling down a lengthy straight of Roman road lined by fields and a couple of small warehouses. Along the same road is an animal sanctuary called Raystede. I have been there before, but not since I was a child; I vaguely remember seeing the cats, and maybe some geese. The second I thought about Raystede, I knew I had to write my next article on it. I ended up going to Raystede a little late in the day, so it was relatively quiet. My first stop was the dog pens. While I am not a huge fan of dogs, I can appreciate a scruffy little thing or two. Many of the pens were empty, and the reason why could be answered by the muggy weather. There was one fluffy dog that kept pacing its pen, clearly eager for one of the staff to give it a walk (which it received minutes later). A greyhound next door was content to stare out at the other dogs, while another one was playing fetch with a volunteer. A couple of people were visiting the sanctuary with their huskies, so when they led them around the dog section a cacophony of different-pitched barks sounded out. I escaped to the wildfowl area, arriving just in time to potentially witness a group of children get mauled by some geese as they fed them bread. It was a sight and a half to see what looked like every species of bird, flocking and squawking and snapping at each other over the little crumbs of bread the children had to offer. As I walked down the barrier, breadless, a few geese and two squat ducks followed me the entire length, honking with hopeful curiosity. I stopped by the chickens and recalled my girlfriend telling me that chickens are simply tiny raptors. Staring into their beady, calculative eyes, I realised I did not want to stick around them any longer. Donkeys are my third-favourite animal behind lions and sloths, so of course I had to go have a look at them. There was a fuzzy tan-coloured Shetland pony standing all by itself, and I was trying to get its attention when a donkey came right up to the fence and tried to nibble on my coat. They were very docile and content to stand around in relative solitude. As I was taking my lighter photo, an announcement came over the tannoy instructing anyone wanting to do the cattery tour sign up at reception. 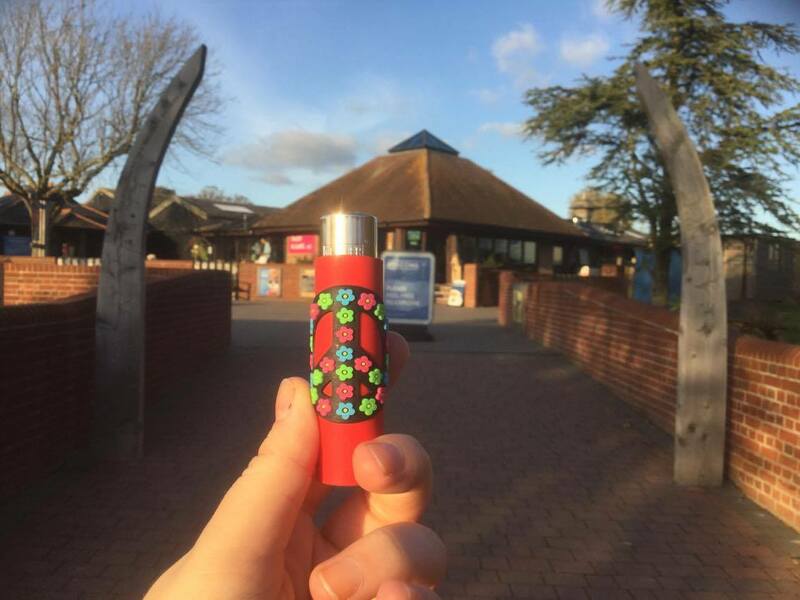 I quickly snapped a photo in front of the hub of Raystede, my lighter snugly fitted with a peace sign cover because I felt it represented the newfound peace and harmony many abandoned or given up animals experience at the sanctuary. They get a second chance to live in love, and be treated as they should be treated. After signing up, one of the staff introduced herself to us and took me, my mum, and a couple back behind the cat pens. One of them, a deaf old white cat, was getting fussed by one of the volunteers. The woman explained to us what Raystede do for the cats – how a large number are being rehomed, hence why many of the pens were empty. She opened up one of the spacious cages and allowed us to meet a couple of loving black cats named Wills and Kate. They had been at the sanctuary since May and loved getting stroked. I near enough cried when Wills shoved his head in my hand – they were so affectionate, and it brought back my longing to have cats of my own. Because our group was so small, she even let us have a look (not touch) one of the baby kittens that had been delivered by caesarean. They had not been sure it would make it. This was clearly the runt, and was absolutely tiny (which is why they named it Peanut). But there it was, smaller than her hand, and mewling at us. It had just opened its eyes. She also led us around to see the more nervous cats, and let out a couple more for us to pet. I was sad when the tour ended, but in retrospect I am happy so many of their animals are getting forever homes. Raystede clearly gives every single animal the best temporary home it can get for the time being. The volunteers are so dedicated, and it definitely shows. Update: We adopted Wills and Kate in November. They have now been renamed Wilko and Ziggy respectively, and are living comfortably!